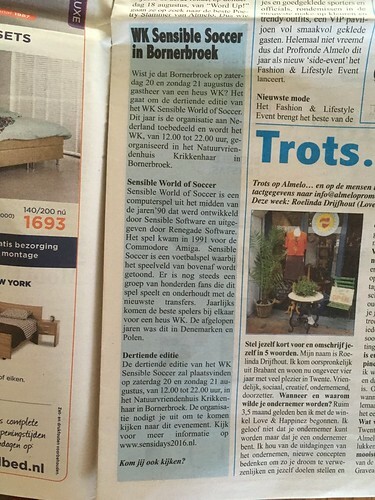 This year the 13th annual Sensible Soccer World Championships took place in Bornerbroek (Almelo) in the Netherlands. As always there were two main tournaments (PC SWOS and Amiga SWOS), andtwo side tournaments (Classic Sensi and X-Box). And there was a bit of sociable soccer. You can find the tournament thread on Sensiblesoccer.de. See you next year in Denmark?! A final press clipping, but a great one. News Website VICE already had a nice article on Sensible Soccer in the Spring, but now has an amazing in-depth article by Fraser Gilbert with interviews with many of the community. Read and enjoy. Some secrets that Gerda, Mark’s Mother served. One of our organisers, Rock and Roll was interviewed by our friends at Swosit. We still have the photos..
Dagblad Tubantia did already a story on the sensidays last week. On Saturday they send a proper reporer Martin Ruesink who did a in dept story on the days. Playaveli is quoted and Romanista and RocknRoll are mentioned. All the Amiga replays are now on the sensidays youtube channel. This was live-streamed to facebook with viewers from all the way from England and Italy. Thanks to Lemonheadiv for capturing the stream. Congrats to all medal winners. And especially to Blazej who won an incredible triple! Tuesday evening Rock en Playaveli finished the Tournament magazine. It is filled history, stories, stats and things about Almelo. If you are not coming, you can find it here and still enjoy the fun.